Craft breweries are sweeping the nation as one of the trendiest businesses to open, and the journey of The Brew Gentlemen Beer Company in Braddock is one of two start-up breweries documented in Blood, Sweat and Beer, a film which will be released in early 2015. Also twenty-somethings, Chip Hiden and Alexis Irvin are filmmakers from Maryland who took notice of the craft beer revolution as it forged on in bars and breweries across the country and decided to make a feature documentary about it. On the creative project funding website, Kickstarter, the couple promised to take viewers “on a fascinating journey beyond the pint to meet the brewers who are revitalizing American beer,” and chose to include The Brew Gentlemen in their project. So, what is craft beer? According to Foster, there are as nearly as many different definitions as there are types of beers, but craft beer is basically about small, independent brewers creating unique beer recipes from traditional or innovative brewing ingredients and its fermentation. “It’s an extremely cooperative, sportsmanlike business; it’s very collaborative,” he said. Irvin says that the film highlights Braddock’s revitalization efforts. 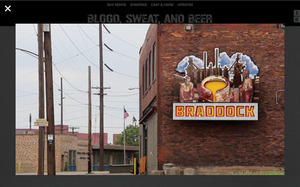 “We were intrigued with Braddock; it’s an industrial community that was essentially abandoned over the past couple of decades, but it’s a beautiful place with a rich history,” she said, adding that Mayor John Fetterman is dedicated to making the once run-down, crime-ridden neighborhood a local destination for specialty businesses like The Brew Gentlemen. Located at 512 Braddock Avenue, The Brew Gentlemen offers an upscale taproom featuring unique brews for drinking as well as bottles for buying. “Chai-spiced wheat beer is our most popular offering,” said Foster, “but we’ve also brewed some wackier beers. For instance, for Thanksgiving, we made a beer with smoked turkey in it.” Food trucks often set up outside, which is bringing even more business into the area. To get a copy of the movie, go to www.bloodsweatbeer movie.com.